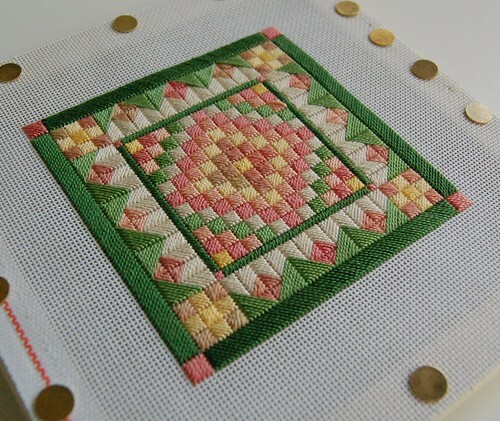 Nicole's Needlework: Grandma's Flower Garden Finished! I started my class project the other day. I'm hoping to have enough progress for a pic tomorrow. It's hard to go from nice, easy canvas work, to over one on 32 ct.! :) Write later! I just love your Grandma's Flower Garden. This has always been a favorite pattern in the quilting world and yours is really pretty! I love the colors. I only hope that I can do these half as well as you do. Your work in so beautiful! Gorgeous work!! You have inspired me to start a freebie from Laura Perin, thanks you enabler!! LOL! The colors are just gorgeous. What a beautiful finish. Love it! The colors are so pretty! What a great job you've done, Nicole. NO one would ever believe that you haven't been doing this all your life. Very gorgeous. I just might have to do this one too. And your LHN Neighborhood is fabulous--you have to get this one framed--its too fabulous to hide it away in a box or tub. I finally finished Reading, and working on the borders of my canvas work piece. This is just beautiful! Grandma's Flower Garden has always been a favorite of mine! Oh, how lovely : ) This is a beautiful project!!! Beautiful work. Wonderful colors. What's up next? I absolutely loves the colors in this design. Maybe I will have to try canvas work in the future. It's beautiful, Nicole. How are these pieces usually finished? wow i like this, i've never done canvas work, i must try this! Wonderful Grandma's Flower Garden! I love the way it looks, I love the colours. It looks wonderful! I have wanted to try one of her designs for a long time. I love the colors. You did a marvelous job!